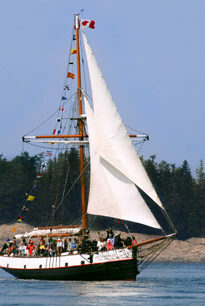 The “Jolly Breeze of St. Andrews” is a classic Tall Ship built in New Zealand and specializes in providing a wonderful and memorable experience for children as well as adults. ‘A Slice of Life’ watching whales and other wildlife aboard a Tall Ship in the Bay of Fundy! After you are welcomed aboard and receive the often humorous safety speech, we will travel across the Passamaquoddy Bay, viewing seals that may be sunning themselves on rocks if the tide is low and swimming nearby if the water is high, until she reaches the playground of the whales, the rich feeding grounds of the Bay of Fundy that entice the whales to this region year after year. Once among the islands porpoise and sometimes white sided dolphins will often approach the boat to enjoy some “boat wake surfing.” Watch the soaring bald Eagles and many other pelagic sea birds feed as well. Passengers aboard “The Jolly Breeze of St. Andrews” enjoy comfortable seating on the main deck. Once on our way, you may stroll about exploring this famous vessel. Below decks are two washrooms, luxurious heated lounge, a private baby/change room and sleeping for ten! Help yourself to an extra jacket, lap blanket or sunscreen. We have you covered! The 3.5 hour tours are suitable for all ages from babies and toddlers, to adults and senior seniors. Successful encounters with whales has exceeded 95% the last few years and between 90-99% the last 14 years. The classic Tall Ship is a true Bay of Fundy added experience, while we are keeping a sharp lookout for MINKE and FINBACK WHALES and if it is into August and September, HUMPBACK and RIGHT WHALES. Once spotting the whales we shall idle and serenely view them. They may surface nearby, as sometimes they are as curious of us as we are of them, or they may dive down and surface elsewhere, in which case we will gradually travel over to them within guidelines, without disturbing their feeding pattern. CRUISE GUIDES are presented to you upon purchase of your ticket. On board there is an ongoing nature and historical interpretation provided by our knowledgeable and friendly crew, with a focus on humour of course! Our experienced crew will teach you about the local wildlife including the Minke, Finback and Humpback Whales, Harbor and Grey Seals, endangered Harbor Porpoise, Bald Eagles, and plentiful sea birds. You will learn about the history of the local area and islands. We pass by many lighthouses, including the famous East Quoddy Head Lighthouse. See first hand and learn about local industry including aquaculture salmon cages, herring weir fishing, lobstering, urchin diving, fishing and scalloping from our experienced captain. Exciting on-board touch aquarium including starfish, sea urchins, crabs and more. 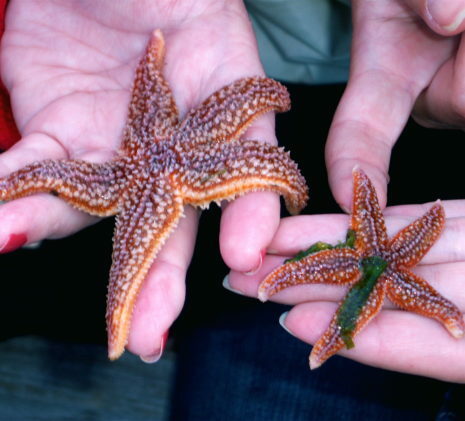 Hold a starfish, touch a sample of whale baleen and see what whales eat. 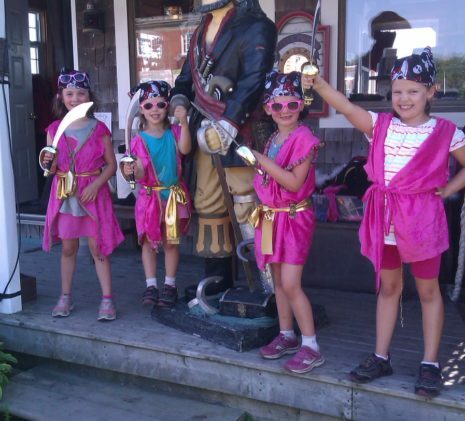 ‘Scurvy Scallywages’ are encouraged to dress up like pirates and haul up a sail. Meet friends sitting around the large mahogany salon table below and participate in face painting, whale colouring and more. Spark their imagination of the sailing life by exploring the bunk beds, cabins, salon and galley. On the way home, it’s time to take the big ships wheel to try a “trick” at steering the ship. Those able to steer a straight course receive a special certificate signed by the Captain upon which parents may place a picture of this exciting event. A glass of Pirate Rum Punch, Baileys and hot chocolate, top-shelf scotch perhaps? Sit back and relax with a glass of wine or beer. Our ship’s galley also features hot chocolate, coffee, tea, chocolate bars, granola bars, spring water, sodas, etc. We also specialize in service providing a complimentary breakfast on the am tour and homemade hot soup on the pm tours. (Donations for Joanne’s famous soup recipe are given to the Grand Manan Whale and Seabird Research station). The Tall ship provides a stable and comfortable ride with the lowest seasickness rates (1 in 3000). We use both motor and sail to optimize the viewing capabilities while still enjoying having the front sails up adding to the ambiance and stabilize wave motion. Experiences of stomach upset are very rare on the Jolly Breeze. She is a very deep, full keeled vessel providing stability and comfort. We are also fortunate in our area of whale watching to be amongst islands and sheltered waters for the majority of the tour. It is safe and stable for young children to older adults. TOUCH TANK with starfish, crabs, sea anemones, shells, etc. Check out samples of whale Baleen, Plankton and Krill. YE and each of you are adjudged and sentenced to be carried back to the place from whence you boarded.